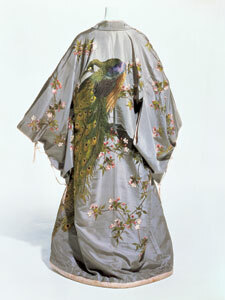 This gown was made by Iida Takashimaya for the Takashimaya department store. This was the first Japan- ese store to export to Western Europe. The garment has a traditional kimono shape, but with a flared cut to suit European tastes.